The proposal, which critics said could put diverse students at a disadvantage, was rejected at the ABA’s Midyear Meeting in Las Vegas by a vote of 88 to 334. The resolution required that law schools achieve a 75 percent pass rate for students within two years of graduation to keep their accreditation. Supporters of the resolution said the change would help law students by ensuring their schools train them to be competitive, but opponents expressed fear it would place minority students at a disadvantage. This is the second time the measure has been rejected over diversity concerns, it was also voted down by the house in 2017. It will now return to the ABA legal education council, which originally proposed the measure both times, and can unilaterally choose to implement it without house approval. The council has said the resolution would not have the adverse impacts that opponents have feared. Barry Currier, managing director for the ABA law school accreditation process, issued a statement after the vote. “The Council understands this is a complex matter. Revisions to the existing standard on bar passage outcomes provide more straightforward and clear expectations for law schools and provide regulation and process that are more appropriate for today’s environment,” he said. He added that the council will consider a report from the house before making a final call. The house and council heard numerous complaints about the proposal in the run up to the vote. “The proposed standard continues to threaten attempts to diversify law schools and ultimately the legal profession,” a Jan. 11 letter from the ABA’s Goal III entities to the council’s president, Jeffrey E. Lewis, said. These four groups were created to help the ABA meet its goal of eliminating bias and enhancing diversity in the legal profession. Their letter said that the proposed standard would provide a very uncertain future for schools with large populations of diverse students, many of whom don’t meet the 75 percent cutoff. The vote on the resolution came as law graduate bar passage rates are going down. 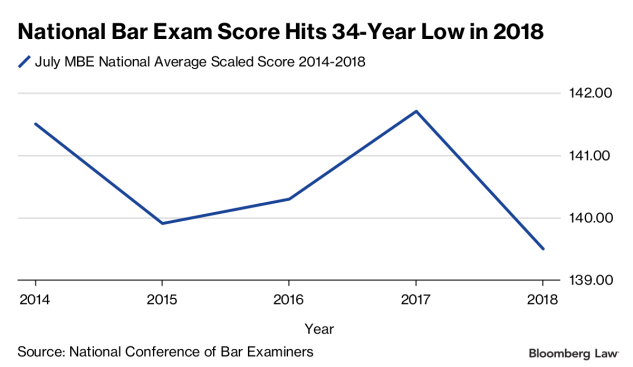 The national average multistate bar examination score for July 2018 was 139.5, down 2.2 points from the July 2017 average. It was the lowest score on this portion of the test, which is required by all states, since 1984. Many states experienced lower overall pass rates as well. California’s July 2018 pass rate was 40.7 percent, down from 49.57 percent in July 2017; New York’s July 2018 pass rate was 63 percent, down from 68 percent in 2017; and Texas’ pass rate fell more than seven percentage points in that same period. According to ABA data, almost 90 percent of 2015 law school graduates passed the bar within two years of graduation. Resolution 105 revises ABA Standard 316, which sets the bar passage rate standard for law school accreditation. The current standard offers law schools several ways to comply with the bar passage requirement, a component of law school accreditation. A school can show that 75 percent of graduates who sat for a bar exam passed within five years of graduation. A school could alternatively show that its first-time pass rate is within 15 percentage points of the pass rate in the jurisdictions where graduates took the exam. Supporters of revising ABA Standard 316 have included legal educators and industry analysts who say the resolution would protect students. The standard as it’s now written makes it possible for law schools to take advantage of students because they aren’t held accountable for failing to adequately prepare students to enter the legal profession, Kyle McEntee told Bloomberg Law. McEntee is executive director of Law School Transparency, a non-profit consumer advocacy group dedicated to educating the public about the legal profession. There were 31 schools with a first-time bar passage rate of less than 60 percent in 2017 and they’re doing more harm than good, McEntee said. Ten months after graduation, these schools had an average unemployment rate of 21.4 percent, he said. The graduates of these schools are more likely to be diverse than the national average; the schools have higher tuition than the national average; and the graduates tend to come from disadvantaged backgrounds, McEntee said. The schools are not helping diversify the profession when graduates can’t pass the bar exam and get a job, he added. McEntee said he thinks the proposed standard will prevent a further decline of pass rates and is likely to improve them. Kelly Testy, president and CEO of the Law School Admission Council, said the proposed standard seems clearer and fairer to both schools and students than the existing one.